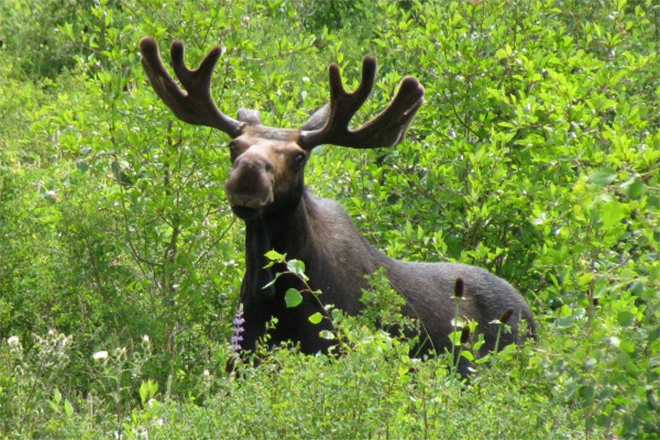 Two high-profile wildlife incidents over the past weekend in Summit County - including videos and a photo showing those involved approaching or feeding moose - have been addressed by Colorado Parks and Wildlife, thanks to tips from the public. CPW officials says it is often the public's help that brings wildlife violators to justice. In these recent cases, social media not only played a role in finding those responsible, many in the public learned about the dangers of approaching and feeding moose after reading public comments about the incidents. This photo posted on Facebook shows a man standing a few feet away from a visibly angry moose in Frisco, Colorado. The moose's ears are pinned back and it's hackles are raised - an indication of an imminent attack. Courtesy CPW & Facebook. "If high-profile cases like this serve to spread the word, whether through social media or the grapevine, that alone has accomplished much of what we are trying to do to inform the public," said District Wildlife Manager Elissa Slezak. "It was encouraging to see how many local folks are already aware of the dangers relating to moose, so there is definitely some community self-policing going on." Slezak stresses the agency's priority is to educate people in order to prevent human injuries or death, and the harassment of wildlife; however, wildlife officers will issue citations in appropriate situations. "It's not only unethical and irresponsible to feed and harass wildlife, it's also illegal," she said. "We will enforce our wildlife laws." 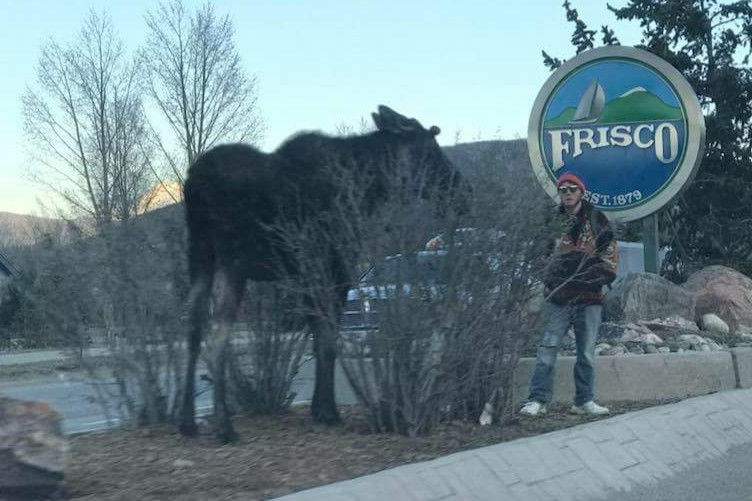 Last Friday, a photo of a man standing next to an agitated moose in Frisco caught the attention of CPW authorities when the snapshot made the rounds on social media. After appealing to the public for help, wildlife officers received numerous tips enabling them to quickly identify the individual. After following up on the tips, wildlife officers learned the individual had been detained by local police later that same Friday evening. Frisco PD contacted him after receiving reports of his erratic behavior, including the incident with the moose. "We know who he is and have attempted to contact him about the moose incident," said Slezak. "We'll evaluate the situation and make a determination about how to proceed when we meet with him." In a separate incident that same Friday, a woman from Summit County posted video on social media of herself feeding a moose through the window of her vehicle. Because of the immediate, harsh backlash from the public, the woman quickly took the post down. After learning her identity, CPW officers contacted the woman on Monday, writing her a citation for illegal feeding of wildlife and a warning for harassment of wildlife. "She expressed remorse for what she did," said Slezak. "She realizes now what a mistake it was, and we believe she has learned a valuable lesson." CPW is not revealing the name of the woman in this release out of concern for her personal safety. "When you consider how severe the response from the public was, I can say she's paid for her mistake," said Slezak. "In fact, I would say the public's response is probably more of a deterrent than the citation she received." In addition to these two incidents, CPW is once again asking for the public's help in an another case of wildlife harassment. Over the weekend, CPW learned of a video showing two young men approaching and trying to touch a moose in Frisco's Drake Landing neighborhood approximately three weeks ago. 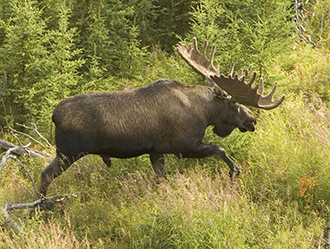 The moose kicked at one of the men with its front leg, appearing to make contact. It is unknown if any injuries resulted from the conflict. "That video is disturbing because the moose appears to actually strike the individual," said Slezak. "That could have easily led to a severely injured young man and we would have had to put that moose down." Slezak hopes once again the public's help can provide information to help identify the the individual, or individuals involved.